The Superman Fan Podcast: Episode #385 Part I: Superman Family Comic Book Cover Dated August 1965: 80 Page Giant #13! I don't have much to add to you commentary here, which is fun, as always. I do want to answer a question you had, though, about "Perry White, Cub Reporter". You wondered if this story was similar to any of the episodes of the George Reeves "Superman" TV show. Not exactly, but there are three episodes which deal with either Jimmy being temporary editor or Perry doing actual reporting. There's "Perry White's Scoop", from Season 2 (The one with the man in the deep-sea diving suit who is shot outside the Daily Planet building.) Perry decides to track down the story without Superman's help, but, of course, Superman does help. 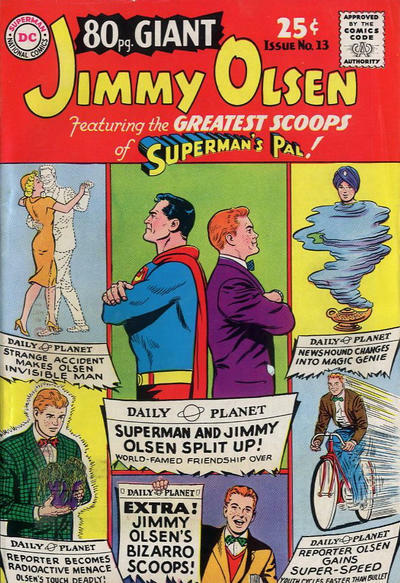 Also in Season 2, there's "Jimmy Olsen, Boy Editor", in which, during a special "Youth Day" in Metropolis, Jimmy becomes editor for a day. Perry doesn't really do much reporting in this one, though. Jimmy gets into his typical brand of trouble by planting a story claiming that the paper has evidence against a crook, who then decides to deal with Jimmy in the usual underworld way. Finally, in Season 5, there is "Money to Burn" (which I always think of a "The Firemen's Friend"), in which the Planet's warehouse catches fire, and it's discovered that the payroll is missing from the warehouse safe. The insurance company refuses to pay, believing the fire was deliberately set to cover up Perry's stealing the payroll. Perry sets out to find the real story and clear his name. Again none of these stories is quite the same as the comic book story, but I wouldn't be surprised if, taken as a group, they might have helped inspire it. Thanks for the info. I think I do remember some of these episodes, especially “Money To Burn”, because of the warehouse fire.